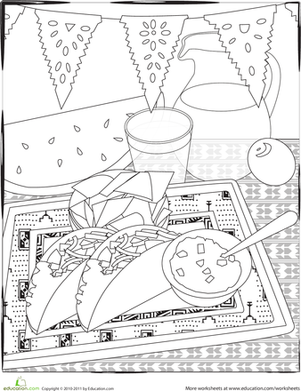 Show your love of rojo, verde, and azul with this "De Colores" coloring page! A popular Spanish folk song, "De Colores" is a celebration of all the colors of creation—and a great way to learn some simple Spanish. Along with your kid, read the lyrics aloud, listen to the song, and have him colour the page with his colores favoritos. Celebrate Dia de los Muertos with an intricate sugar skull coloring page! Your child will learn a bit of Mexican culture as he adds bright colors to this skull. Colour in this fancy yacht coloring page as it sails into the sunset.